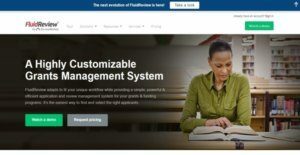 FluidReview Grants Management (formerly known as ReviewRoom) is a simple, powerful, and efficient online grants management system that provides organizations with an easy way to gather, manage, and evaluate applications and candidates for their grants and funding programs. This software solution is highly customizable, which means it is designed to fit one’s unique workflow. FluidReview Grants Management comes with key features that help organizations efficiently handle each stage of their grants programs and processes, and select the right grant applicants. It has a grants programs portal that gives grantseekers a convenient place where they can apply for grant programs whether small, large, or multiple grant programs. A secure reviewing and evaluation portal is also provided so reviewers can assess and rate applications. The online grants management system is built with interactive dashboards that make applicant tracking and management a breeze. From these dashboards, users will be able to view incoming applications, filter and prioritize applications, promote or disqualify grant applicants, and send email reminders and notifications. FluidReview Grants Management delivers automated features such as the ability to match applicants to the grants they are eligible for, group applicants using a set of criteria, and set up triggers to activate tasks that are usually done manually. Users can build workflows and tasks which they can customize to match their existing grants programs as well. To streamline the application review process, reviewers can evaluate submitted applications using custom and interactive review forms. Last but not least, FluidReview Grants Management provides pages dedicated to sponsors and donors where biographical data, logos, and things that describe sponsors and donors can be viewed. FluidReview Grants Management is considered as an end-to-end grants management software solution because it has been assisting organizations around the world in managing all phases and stages of their grants management programs easily and with flexibility. As a flexible and easy-to-use grants management system, it can be used for any type of grant programs whether small, large, or multiple; providing organizations with all the tools and functionalities they need in order for them to collect, administer, and evaluate grant applications and candidates. Among the features that organizations can appreciate in this software solution is that it streamlines how prospective grant applicants search for the available grants they are eligible for and submit their applications. They can do this through an online application site that users can set up and customize to match their organization’s branding. Such site is actually a portal where grant programs can be posted, including the criteria and requirements that prospective applicants need to meet. This facilitates the application process, and at the same, makes it convenient for grantseekers to apply for grants. FluidReview Grants Management is built with an intuitive and flexible workflow editor. This editor is so powerful in such a way that it enables users to create all important tasks and processes related to the application process. These include workflows for both applicants and reviewers. As they set up tasks and processes within the software solution, they can create rules and guidelines, criteria, and custom application forms. They can even set up and use the same criteria for multiple grant programs. FluidReview Grants Management allows users to build powerful, interactive, and smart online forms. They can integrate the system with FluidSurveys, a leading web-based survey and form solution. Because of this, they will be able to create online forms and personalize them. They can take advantage of over 35 question types, enable logic in the forms, and include custom options to give their applicants a personalized experience. Once they are done creating their forms, they can then add the forms to any stage of the grant management process. The online grants management system provides users with complete control over the grant management process from start to finish. They can access intuitive dashboards that help them evaluate their entire process in a comprehensive manner. Also, the system lets them produce reports that show tabulated rankings and evaluations. This way, they will be able to take actions immediately based on whatever data they have at hand. If they want to monitor all the actions and activities being performed within the portals or sites, the system can generate audit trails where those actions and activities are recorded. If you are considering FluidReview it could also be a good idea to analyze other subcategories of Best Grant Management Software listed in our database of SaaS software reviews. There are popular and widely used solutions in each software category. But are they essentially the best fit for your organization’s specific wants? A trendy software solution may have thousands of users, but does it offer what you require? For this reason, do not blindly shell out for popular systems. Read at least a few FluidReview reviews and mull over the aspects that you wish to have in the software such as the price, main features, available integrations etc. Then, select a few apps that fit your needs. Check out the free trials of these apps, read online comments, get explanations from the seller, and do your homework thoroughly. This profound research is certain to aid you choose the best software platform for your firm’s special requirements. How Much Does FluidReview Cost? Everything you need to streamline processes and automate workflows. Advanced features for managing programs across your organization and integrating with other tools. We realize that when you make a decision to buy Grant Management Software it’s important not only to see how experts evaluate it in their reviews, but also to find out if the real people and companies that buy it are actually satisfied with the product. That’s why we’ve created our behavior-based Customer Satisfaction Algorithm™ that gathers customer reviews, comments and FluidReview reviews across a wide range of social media sites. The data is then presented in an easy to digest form showing how many people had positive and negative experience with FluidReview. With that information at hand you should be equipped to make an informed buying decision that you won’t regret. What are FluidReview pricing details? What integrations are available for FluidReview? FluidReview Grants Management integrates with Salesforce and FluidSurveys.